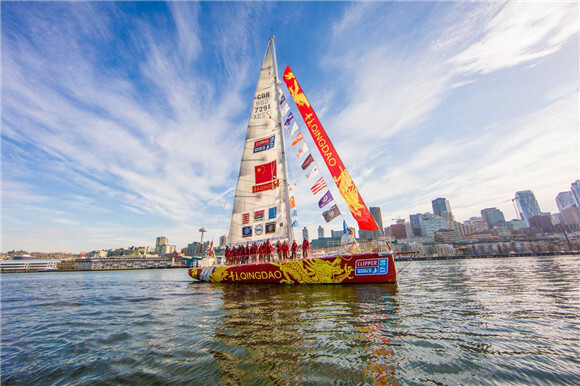 Qingdao has claimed victory in the Mighty Pacific Leg 6 of the Clipper Round the World Yacht Race: a 5,600 nautical mile marathon across the most remote and inhospitable stretches of ocean on earth from Qingdao to Seattle, USA. The Qingdao team, skippered by 32-year-old German yachtsman Chris Kobusch, crossed the finish line off the northwest coast of the USA at 22:27 UTC on Thursday 19 April, some 27 days after setting off from China to claim its first race win of the 2017-18 edition. Whilst Qingdao managed a convincing win, the racing was once again down to the wire for the remaining race position with second to seventh placed teams separated by just 8 nautical miles (nm), during the final day of racing across the planet’s largest expanse of ocean. Speaking on arrival, Chris said: "It is an incredible feeling to win Race 9 and I am very happy for the team. Everyone was anxious that Sanya Serenity Coast and Unicef would catch us, we were watching them on AIS as they appeared on and off. "I think when the big low came through and strong winds came it was probably the angles we sailed and the sail settings that clinched the win, but it was a tough race with some very strong competition." Fellow Chinese team Sanya Serenity Coast, led by Australian Skipper Wendy Tuck, crossed the finish line at 08:01:15 UTC on 20/04 to claim its fifth podium of the Clipper 2017-18 Race and maintain its lead in the overall standings. Unicef, Skippered by British Sailor Bob Beggs, finished third.